A direct train connection between Liège, Maastricht and Aachen is being made possible now that the track is being doubled on an important stretch of line between Heerlen and Landgraaf. The Dutch Ministry of Infrastructure and Water Management has reached agreements about this with regional administrators. Central government, the Province of Limburg and the region are jointly investing in the required extension of the track. That will facilitate good international connections in the region in the short term and faster intercity links in the long term. Did you know that at present, there is only one possibility per hour to travel by train from Parkstad to Aachen: with the diesel shuttle service from Heerlen to Herzogenrath where you have to change trains for Aachen. There is no longer a direct connection. The Province of Limburg would like to facilitate a second cross-border passenger train to Aachen. This will make it easier and more attractive to work, live, study or shop across the border. A boost for the economy, employment and knowledge exchange. A doubling of the tracks between Heerlen and Landgraaf will facilitate a second international hourly train service in each direction between Maastricht, Heerlen and Aachen. 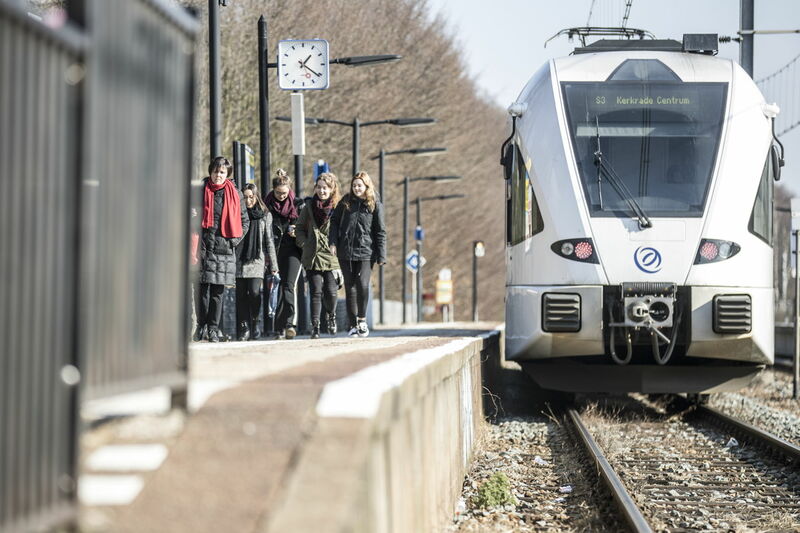 Arriva – which will be providing public transport in Limburg until 2031 – also wishes to contribute to a shorter travelling time and an increase in frequency. That can be achieved by offering a second hourly train between Maastricht, Heerlen and Aachen. However, the single track between Heerlen and Landgraaf must first be doubled. Double track will make it possible for the intercity from Eindhoven to Heerlen to continue to Aachen and eventually to Cologne. To make better use of the capacity on the line, more signals will have to be installed between Landgraaf and the German border. In addition, extra points will have to be fitted and existing points and bends will have to be adjusted for higher speeds. The doubling of the track will mean that a Three-Country Train between Liège, Maastricht and Aachen will be a step closer. Passengers will then have a direct train connection twice an hour from the Netherlands to important rail junctions in Germany and Belgium. This will make travelling in the border region easier and more comfortable.